Note: If you’re not familiar with X_STUDY®, I encourage you to review the X_STUDY materials on our website. You’ll gain a solid understanding of this trader-centric charting application, which is fully integrated with TT’s X_TRADER® platform and provided to all X_TRADER users at no additional cost. As the product manager for X_STUDY, TT’s charting and analytics application, I’d like to talk about constant volume bars. Constant volume bars build bars based on fixed volume instead of fixed time. There are several advantages to constant volume bars when compared to time-based bars. Shorter time-based bars, like one-minute and five-minute bars, are great during the day when there are many market participants and the market tempo is fast. When market tempo slows and price action begins to consolidate, shorter time-based bars will continue generating bars as time passes. Too many of these time-based bars will inevitably flatten out your analytics, which can then generate whipsawed losing trades or take you out of a good trade. A constant volume bar conforms to the market’s tempo. As the market tempo slows, so will the formation of new bars. As the tempo increases, so will the number of bars created. Volume bars are ideal for when events happen in the marketplace, too. 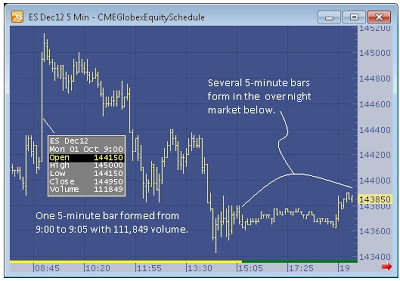 For example, the release of an economic event at 1:15 can leave your five-minute bar waiting until 1:20, while the volume bars have already created four new bars in that five-minute window. These four faster-responding volume bars give your strategy more opportunity to react to the event that has just occurred in the market. Likewise, who needs 12 five-minute bars from 12:15 to 1:15 before that economic number comes out when volume is light? Your analytics will be flat with time-based bars and won’t be able to help you make decisions. A volume chart in this same period might only form one bar. The concept of constant volume bars creates an intelligent bar that reacts to the market’s trading volume. Let’s look at the scenario below, which uses the ES Dec12 contract from earlier this month. 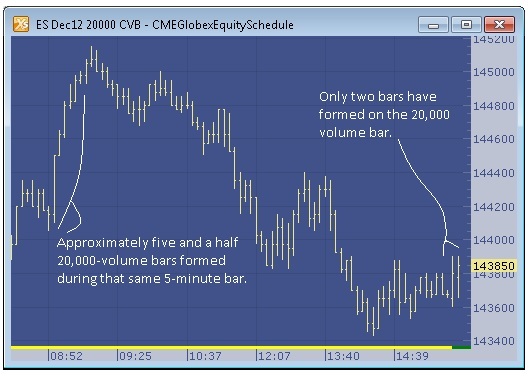 Compare a five-minute chart to a 20,000-volume chart. It will show advantages for when markets have both a fast and slow tempo. 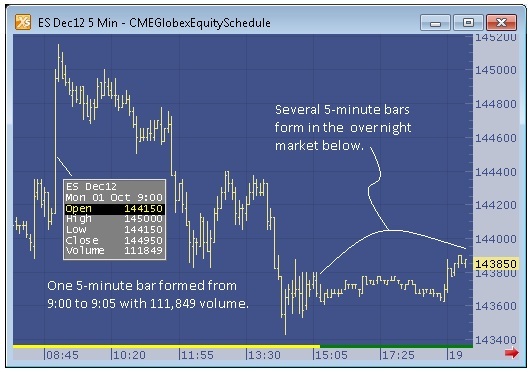 The five-minute bar chart shows a one-bar spike in the morning hours. The 9:00 to 9:05 a.m. bar in ES spikes to 1450.00. Comparing this bar to the 20,000-volume chart, we can see that approximately 5½ bars were formed on the constant volume bar chart during the same time. The 20,000-volume bar has only produced two bars, with the second one still incomplete. At the time of the screenshot, the bar was only half complete, with around 11,000 volume. This example illustrates the improvement constant volume bars provide in both fast- and slow-moving markets. In my experience, I’ve found that constant volume bars can really improve analytics and help eliminate some of the whipsaws.This isn’t to say time-based charts are unnecessary. In fact, I myself still use time-based charts in much of my analysis. I don’t think I could give up daily charts; they are just too ingrained in my analysis. Rather, I’m simply suggesting that you might gain a little edge by looking at a combination of volume-based and time-based charts.Until next time, plan the trade and trade the plan.